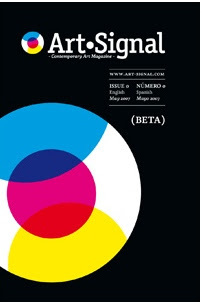 I want to call your attention to a new bilingual (Spanish/English) publication - Art Signal Contemporary Art Magazine - that a dedicated and creative troika in Barcelona (José Ramón González, Patricia Peláez, and Eduardo Z. Sarmiento) have launched. The first issue - #0 - hit the web in my neck of the woods on May Day! It will appear in multiple formats - on the web, as a free pdf, and as a print on demand paper version. Among the unanticipated benefits of keeping this blog is that Eduardo wrote and invited me to contribute a short essay for the innaugural 'Camera Lucida' column which I did. (So my plug here is not just other-regarding.) My essay is entitled "What to do with Invidious Distinctions?" If you want to know the answer go check out the magazine. And read the other contributions too! I am truly flattered to have been invited on this big adventure. And I admire José, Patricia, and Eduardo for charting the course.